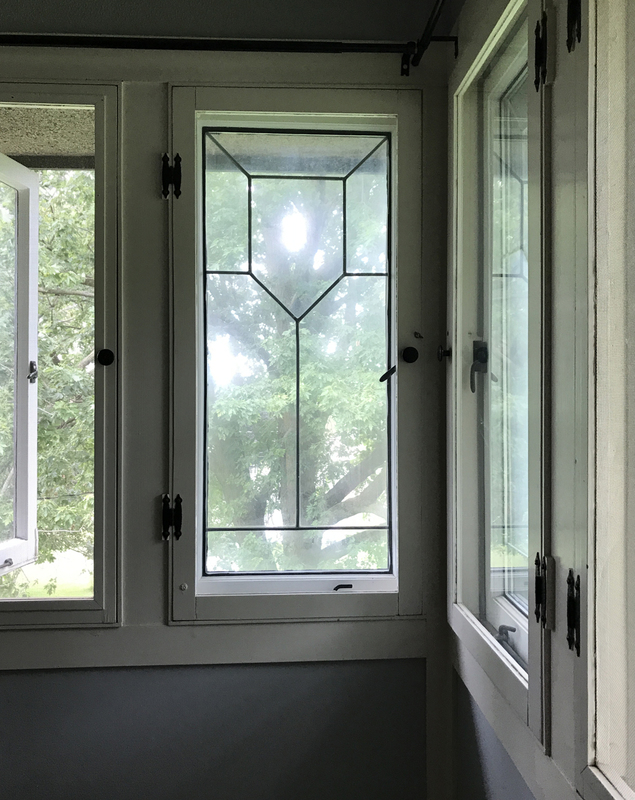 For a 100-year-old-house, the original wood casement windows in our American System System Built Home are in excellent condition. This is largely due to the fact that the house has been fortunate enough to pass from caring owner to caring owner. We learned from the grocer’s daughter, for instance, that it was her father who had carefully reglazed the windows and built the interior (storm) windows and screens. And according to a longtime neighbor, the windows were a point of pride for the teacher who owned the house for many years after the grocer sold it. The neighbor told us that the teacher spent his summer breaks tending to the house and preserving the wood windows. 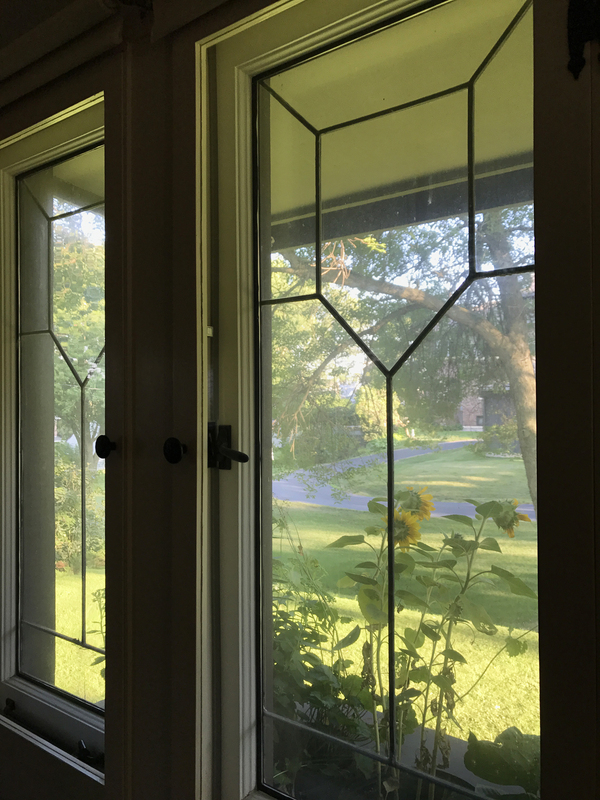 There are twelve zinc glass windows in the house – two in each corner of the three bedrooms, five on the south wall in the living room and one in the window beside the front door. 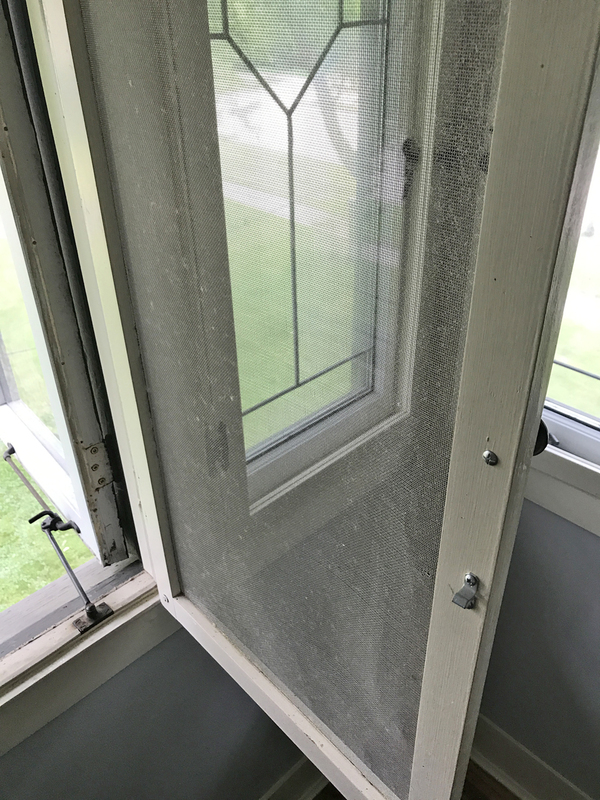 (The three narrow doors leading to the sunporch are also zinc glass in the same design.) The rest of the windows are standard wood casement windows – most of which open fairly easily. We don’t really open the zinc glass windows very often because, well, why tempt fate with something one-of-a-kind? The inner windows were not a part of the original design of the house. We were visited by the daughter of a former owner, the town grocer, who informed us that it was her father who had built the windows and screens. The grocer and his family lived in the house through the late 1970’s so the inner windows and screens were likely constructed around that time. You’ll also note the early-American style hinges on the windows. It seems that, it being the 1970’s and all, the grocer’s wife was a big fan off early-American style. That’s also an indication of when the windows were added. There are also screens that were built for nine of the windows. Three screens for each of the larger bedroom, two screens for the smaller bedroom, plus one screen for the kitchen and one for the dining room. Since we know that these screens were built by the grocer, we don’t know what was originally in place. Likely, nothing. In the other ASB homes we’ve been in, we’ve seen a number of retractable and removable screens in the windows. I don’t think the original American System Built Home plans called for screens. That was likely up to the owner. 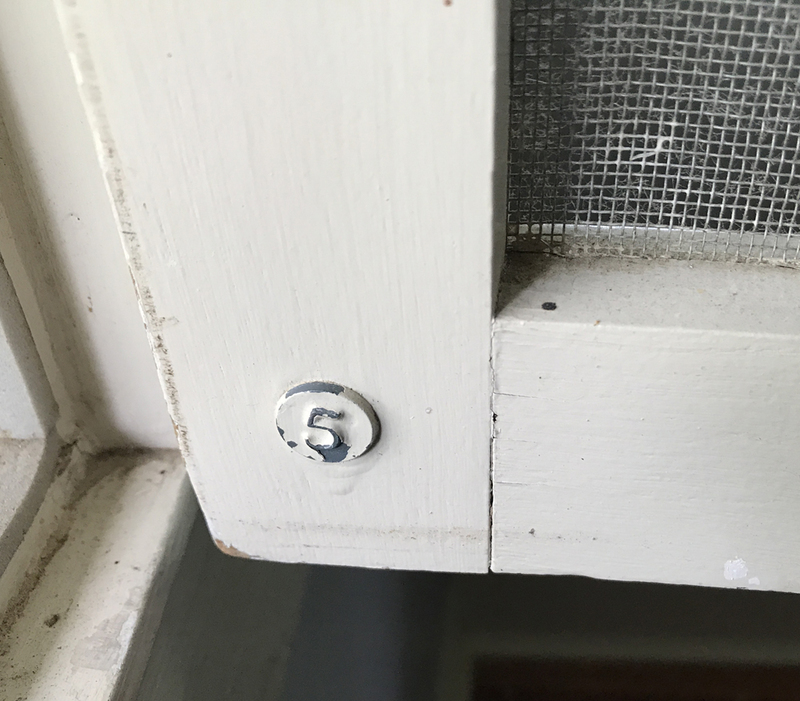 The screens and windows are numbered with helpful little pins that were sold at a time when storm windows were a more common feature houses. 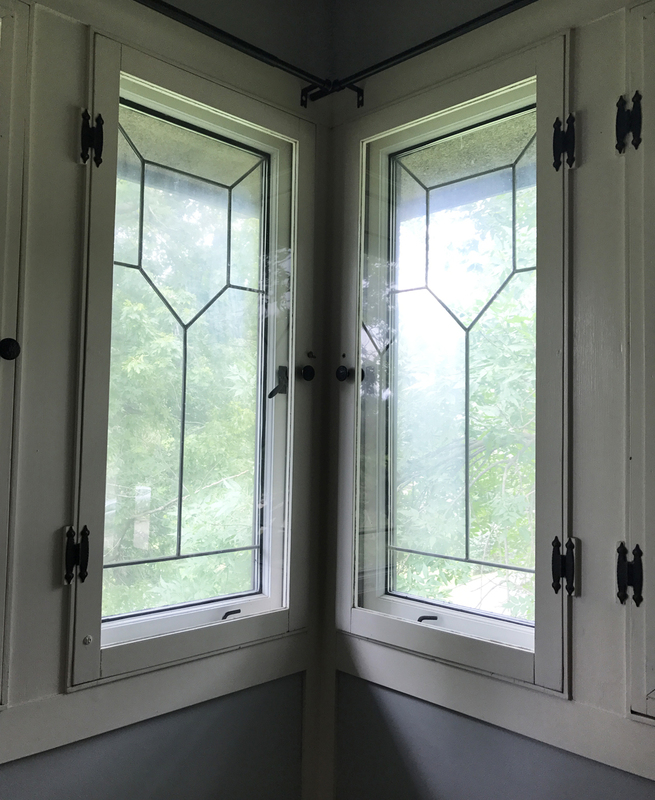 I’d love to replace the early-American hinges with something that’s more in keeping with the Prairie style of our ASB home, but there are a total of 74 hinges on the windows. And that’s not including the hinges on the screen! If I include those, it would take 94 hinges to replace them all. If anyone out there has the hook-up for cheap but handsome hinges, let me know. As the current stewards of the house, we are doing our part to care for the windows. 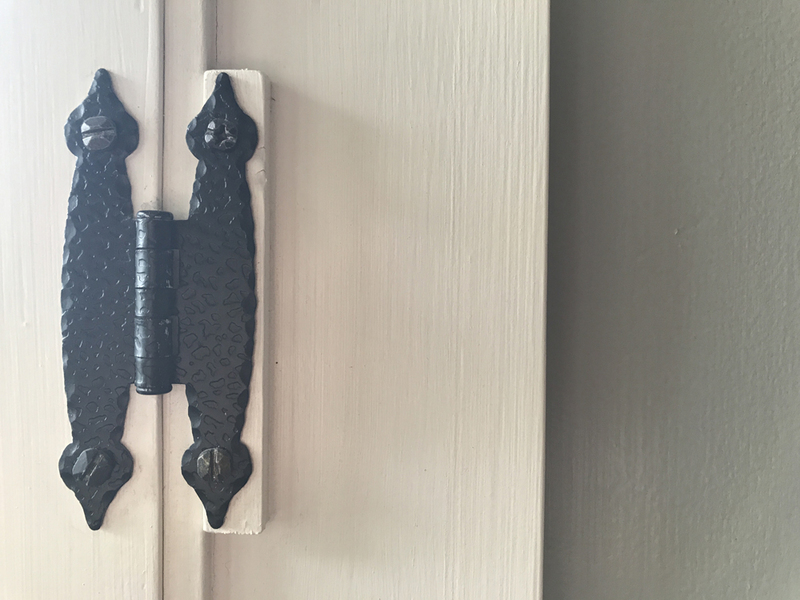 Every summer I oil the casement stays and other hardware. 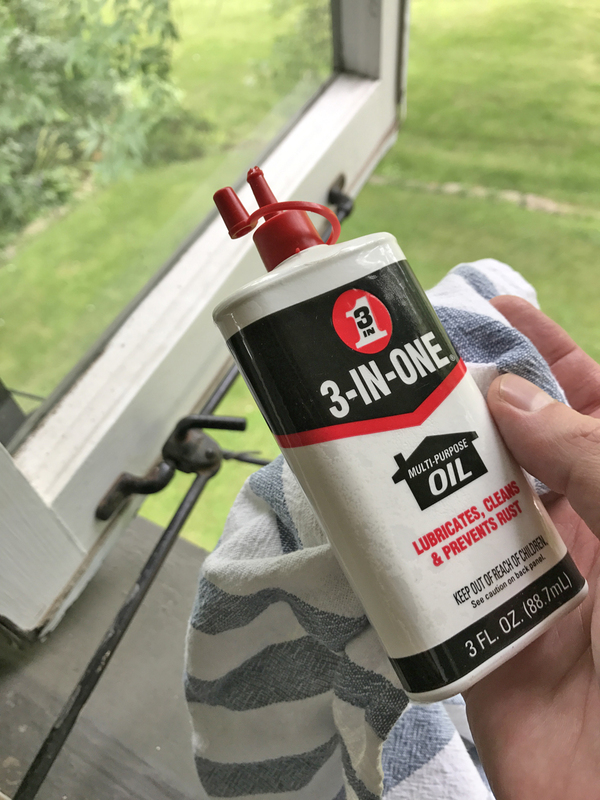 Oiling not only helps extend the life of the adjusters, it makes it much easier to open and close the windows. As with any wood windows, some of them are easier to open than others. The swelling and shrinking with the seasons wreaks havoc on the wood each year. There are a few windows that are going to need a little more attention next spring. 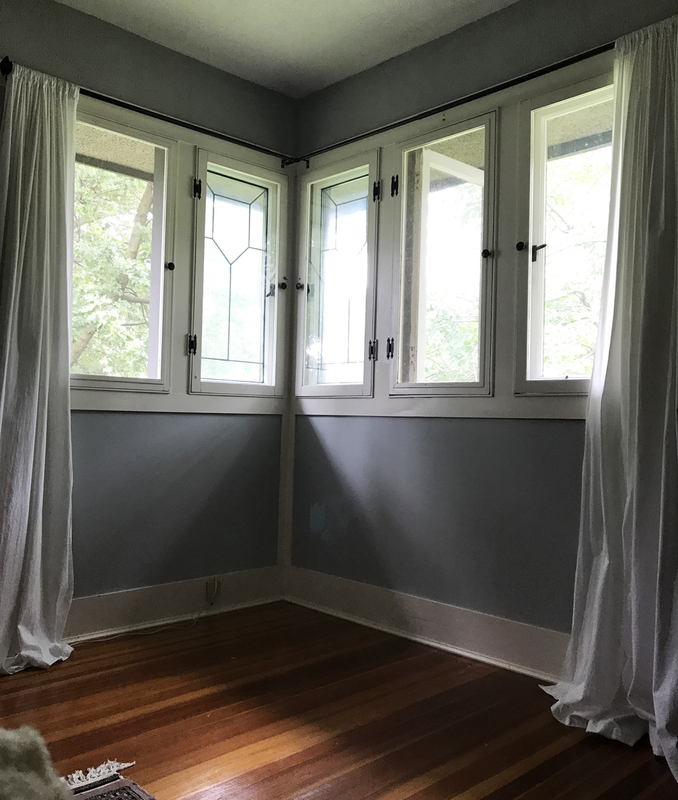 In a house that is lacking a lot of other original features, we consider ourselves lucky to still have the windows that were installed in the house when it was built in 1917. Here’s to keeping these windows going strong for another 100 years! This entry was posted in American System-Built Home, architecture, Frank Lloyd Wright, history, Prairie School on 01/16/2018 by Jason. P. S: where is the house situated, it looks beautiful.